Recent data have found that Plasmodium ovale can be separated in two distinct species: classic and variant P. ovale based on multilocus typing of different genes. This study presents a P. ovale isolate from a patient infected in Ghana together with an analysis of the small subunit RNA, cytochrome b, cytochrome c oxidase I, cysteine protease and lactate dehydrogenase genes, which show that the sample is a variant P. ovale and identical or highly similar to variant P. ovale isolated from humans in South-East Asia and Africa, and from a chimpanzee in Cameroon. The split between the variant and classic P. ovale is estimated to have occurred 1.7 million years ago. It is usually assumed that the four major human malaria species Plasmodium falciparum, Plasmodium vivax, Plasmodium ovale and Plasmodium malariae have no animal reservoirs and that zoonotic Plasmodium infections in humans are highly unusual. The recent finding that Plasmodium knowlesi is found in several countries in Southeast Asia, where it has been wrongly classified as P. malariae, shows that molecular typing may change the understanding of human malaria as an infection strictly transmitted between humans[1, 2]. Plasmodium ovale was first described from West Africa in 1922 and subsequently from every continent. In West Africa, a blood film P. ovale parasite positive rate between 0.7% and 10% has been found. However, in other areas the occurrence of isolated cases is difficult to explain without an animal reservoir. Characterization of P. ovale from Southeast Asia based on the small subunit rRNA gene and parts of the cysteine protease, ookinete surface protein and cytochrome b genes indicate that P. ovale can be divided into at least two types, classic and variant, which do not differ morphologically[5, 6]. Variant P. ovale seems to be associated with higher parasite density in humans[7–9]. A recent study of 55 P. ovale isolates from around the world clearly showed that variant and classic P. ovale co-exist and do not recombine. A study comparing sequences from the cytochrome b, cytochrome c oxidase 1 and lactate dehydrogenase genes of Plasmodium spp. from gorilla (Gorilla gorilla) and chimpanzees (Pan troglodytes) with P. ovale from humans found one variant P. ovale in a chimpanzee closely related to the human variant. This study describes the molecular characterization of a P. ovale isolate from a patient infected in Ghana, showing that the isolate is a variant P. ovale based on the characterization of five genes, and that it is identical or highly similar to a P. ovale variant isolated from a chimpanzee and from humans in two separate studies[5, 10]. The time of the phylogenetic split between the two species is estimated at 1,7 million years ago. The patient was a 59-year-old Danish male, admitted with fever in March 2009 after traveling in Ghana for two weeks in November 2008, who had not taken prophylaxis regularly. The itinerary included Accra, the Volta River and a resort on the Cape Coast. Except for hypertension and atrial fibrillation, he was previously healthy. He had visited Ghana for short visits in 2005, 06 and 07. Fever started nine days before admission, with no focal symptoms. Physical examination at admission was normal. At admission the laboratory tests showed a C-reactive protein of 59.9 mg/l (< 8), haemoglobin 9.4 mmol/lit (8.1 - 10.3), white blood cell count of 6.0 with relative lymphopenia of 0.21 (1.3 - 3.5 x 10^9/l) and a thrombocytopaenia of 93 (145 - 350 x 10^9/l). Thick and thin blood films showed a P. ovale infection with an initial parasitaemia of 0.5% and numeration of the parasite density found 11,600 parasites per μl blood (Figure 1). The second day the parasitaemia was estimated to 0.1% with a density of 1,100 parasites per μl blood. Quick-test (Binax, Bedford, UK) was negative. Chest X-ray showed pneumonia on the left side, and the patient was treated with ceftriaxone intravenously. 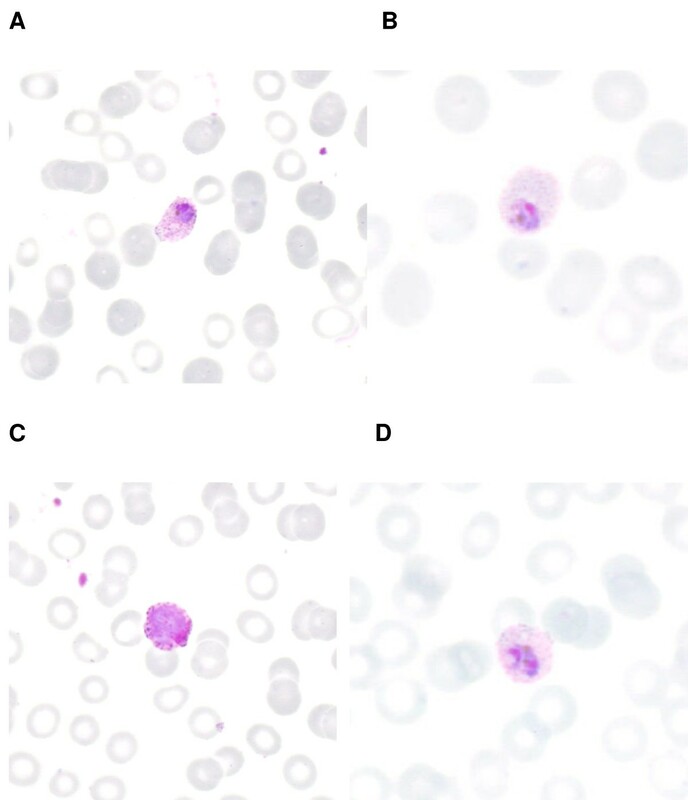 Giemsa stained, thin blood film showing P. ovale throphozoite with Schüffner dots (A and B); a P.ovale gametocyte (C); and an early schizont with two chromatin dots (D). The patient was treated with chloroquine phosphate over three days followed by primaquine 15 mg daily for 2 weeks. During the first two days hypotension with a systolic pressure of 80 mmHg was successfully treated with infusions of saline. The patient was discharged on day 7 in good condition and no relapse has been observed over an eighteen month follow up. Parasitic genomic DNA was extracted from whole blood using NucleoSpin Blood QuickPure (Macherey-Nagel, Düren, Germany) according to manufacturer's protocol. All PCR reactions were performed with Expand High Fidelity PCR System (Roche, Basel, Switzerland) using primers and concentrations as described in Additional file 1: table S1. Reactions also contained 5 μL 1/100 diluted genomic DNA (possrdna) or 1uL 1/10 diluted DNA (all other genes), 200 μM each dNTP, 2,6U enzyme (1U for poldh and possrnda inner nests) and 1,5 mM MgCl2 in Expand High Fidelity Buffer, final volume 50 μL (20 μL for inner nest reactions). Plasmids were purified using Qiagen Plasmid Mini Kit (Qiagen, Hilden, Germany) according to manufacturers protocol. Sequencing was performed with BigDye Terminator 3.1 (Applied Biosystems, Foster City, California) on an ABI3130 platform. Three separate clones from each construct (except pocysp for which only one clone was sequenced) were sequenced; conflicts were resolved by majority vote. Sequencing data was assembled and consensus sequences aligned in CLC Main Workbench 5.6 (CLC bio, Aarhus, Denmark), gap open cost = 10, gap extension cost = 1 and end gap cost = as any other. Phylogenetic trees were calculated in CLC Main Workbench 5.6 using Maximum Likelihood Phylogeny. The initial tree was calculated by Neighbor Joining and a HKY substitution model with a transition/transversion ratio of 2.0 was used for inferring phylogenetic relationships. The sequences of pocytb and pocox1 from the patient isolate were concatenated in CLC Main Workbench 5.6 and the resulting sequence was aligned to concatenated pocytb and pocox1 sequences from 11 Plasmodium species in NCBI GenBank (for classic P. ovale FJ409567 and FJ409571 were used for pocytb and pocox1 respectively). The final alignment was 1671 nucleotides in length. The BEAST software was used to estimate the divergence time, using Plasmodium gallinaceum as an outgroup and assuming a divergence time of 6 +/- 0.5 MY (normal distribution) for P. falciparum/Plasmodium reichenowi for calibration of the tree. The site model was HKY with estimated base frequencies and a 4 category gamma site heterogeneity model. An uncorrelated lognormal relaxed clock was used, and the tree prior was set to Yule Process. The chain was run for 2.000.000 cycles and data points were logged at every 200 cycles. Fever developed four months after a two-week visit to Ghana and at admission, the patient had a microscopically diagnosed P. ovale infection with a parasitaemia of 0.5% and the presence of asexual forms, early schizonts and gametocytes (Figure 1). A rapid test (Binax®) was negative. Because of the recent reports of variants of P. ovale and because the patient had a negative rapid test, the isolate was sequenced for further characterization. Part of the asexually transcribed small subunit (18S) ribosomal DNA (possrdna) gene from the isolate was compared with classic and variant sequences published in recent studies from Asia and Africa[5, 10], revealing closer resemblance to the variant type from both studies (table 1). To further characterize the isolate, the pocytb, pocysp, pocox1 and poldh genes were sequenced and compared with sequences from three recent studies. The isolate sequences were 100% identical to the pocytb variant type sequences reported in all three studies[5, 10, 11], 99,8% identical to variant type cysp from Asian isolates, and 100% identical to variant type pocox1 and poldh from African isolates. The isolate was also compared to pocytb, pocox1 and poldh sequences isolated from a chimpanzee, revealing 100% identity in all three genes (Table 1). Comparison of the present isolate with sequences published by Sutherland et al , Win et al  and Duval et al . Comparisons are given as identities/sequence length (percent), except for possrna which are given as a range of identities/range of sequence lengths (percent range) due to varying lengths and polymorphisms in this gene. A phylogenetic tree was constructed based on the concatenated sequences of all five genes studied and sequences published in GenBank (Figure 2). The P. ovale variant type together with the present isolate formed a clade related to but separate from the classic type. Calculation of phylogenetic trees based on individual genes yielded equivalent results. To estimate the split between variant and classic P. ovale, Bayesian Inference was used as implemented in the BEAST software with a calibration point of 6 Million Years (MYs) +/- 0.5 MYs for the human/chimpanzee speciation event as represented by the P. falciparum/P. reichenowi split, which gave an estimated age of 1.7 MY (95% Highest Posterior Density 0.25-4.44MY) for the most recent common ancestor of the variant and classic P. ovale. Phylogenetic tree based on the concatenated sequences of possrdna, poldh, pocysp, pocox1 and pocytb. Scale bar indicates expected number of substitutions per nucleotide site. The recent study of 55 P. ovale isolates from around the world clearly showed that P. ovale can be divided in two species: classic and variant (suggested named Plasmodium ovale curtisi and Plasmodium ovale wallikeri) . The two species currently circulate side by side in the same geographical areas and are not recombining even though they infect the same host. It is not known whether variant P. ovale continues to circulate in both humans and primates and it is intriguing that the variant and classic strains do not recombine. One explanation for the speciation could be specificity for different Anopheles species[10, 13], another possibility is receptor divergence. Humans ceased producing N-glycolylneuraminic acid (Neu5Gc) around 2 to 3 million years ago but continued producing N-acetylneuraminic acid (Neu5Ac) in contrast to old-world primates who synthesize both. Neu5Gc has been shown to interfere with the binding of P. falciparum Erythrocyte-Binding Antigen 175 (PfEBL-175) to chimpanzee erythrocytes, possibly explaining why P. falciparum does not infect chimpanzees. The evolutionary timing of the loss of Neu5Gc coincides with our estimated divergence time of 1.7 million years, which is in agreement with the estimate of Sutherland et al. , and could explain the split between the two P. ovale variants by a similar mechanism in which only classic P. ovale is sensitive to Neu5Gc interference. The chimpanzee can be infected with P. ovale, but the infection is self-limiting[16, 17], though it is not known whether these experiments were performed with variant or classic P. ovale. P. ovale in chimpanzees closely related or identical to human variant P. ovale has been described in Cameroon, and three different genes from the isolate described here (pocytb, pocox1 and poldh) are 100% identical to this variant. This suggests that the P. ovale used by Bray[16, 17] was a classic P. ovale strain. The data presented here further indicate that P. ovale which naturally infects chimpanzees can also infect humans, and that the isolate described here is identical or closely related to the variant isolates sampled in South-East Asia[5, 10] and Africa . All five genes sequenced here support the segregation of P. ovale into two distinct species. Molecular typing has clearly demonstrated that P. knowlesi infections in Southeast Asia has been misdiagnosed as P. malariae and that P. knowlesi is much more widespread than previously thought[1, 2]. Few data exist on P. falciparum, but the recent finding of a new Plasmodium in chimpanzees in Gabon closely related to P. falciparum and P. reichenowi[18, 19], show that more studies are needed to fully understand the dynamics of malaria transmission between humans and potential animal reservoirs. Linda Duval kindly provided the sequence for the chimpanzee ldh gene, and Mikkel Schierup provided feedback on divergence time computing. DT performed the sequencing and carried out the molecular genetic studies in cooperation with JV, and DT and FFA drafted the molecular biology part of the manuscript. EP and JV drafted the medical part of the manuscript. All authors read and approved the final manuscript.